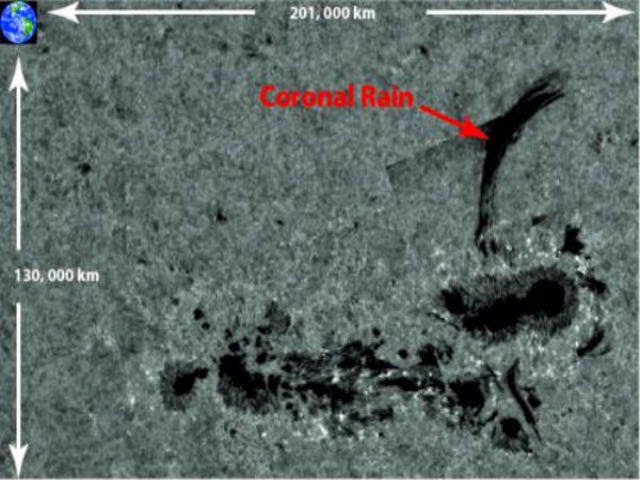 Solar rain was discovered nearly 40 years ago, lately have researchers had the technology to witness it in great detail. By means of extremely innovative satellites such as NASA's Solar Dynamics Observatory (SDO) and the ground established Swedish 1-m Solar Telescope (SST) on the Canary Islands off the northwest shore of inland Africa, a group of physicists has now formed several of the perfect images ever of a rainstorm on the exterior of the Sun. Directed by Eamon Scullion of Trinity College Dublin in the UK, the group detected a massive ‘waterfall’ of material falling down from the Sun’s external atmosphere to land on a big sunspot on its surface. Also recognized as 'coronal rain', the rain on the Sun is made up of electrically charged gas, and cascades at about 200,000 km/h. And these are no normal plasma raindrops; each one is the size of Ireland, about 84,000 km². By means of images taken of a solar rainstorm in June 2012, Scullion and his group have figured out how they are made, and according to Robert Massey at Phys.org, it's astonishingly alike to how rain is formed on Earth. The Sun’s atmosphere comprises of clouds of hot, dense plasma. If the circumstances are accurate, these clouds will cool and shrink, and drop back to the Sun’s exterior as raindrops. To complete the sequence, the plasma must then vaporize on the exterior of the Sun and return to the atmosphere. This happens thanks to solar flares, the most dominant eruptions in the Solar System. Reaching temperatures of numerous million degrees Celsius, solar flares are supposed to be the central cause of heat in the Sun’s external atmosphere. Scullion and his group propose that plasma rainstorms might help to regulate temperature variations in the Sun’s atmosphere. He told Phys.org "Showers of 'rain' and waterfalls on the Sun are quite something, though I wouldn't recommend taking a stroll there anytime soon. But the parallels with weather on Earth are both striking and surprising."